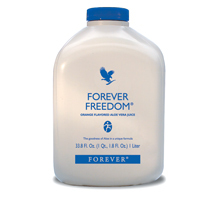 Forever Freedom has combined aloe vera with substances that are helpful for the maintenance of proper joint function and mobility in a tasty, orange-flavored juice formula. We've taken Glucosamine Sulfate and Chondroitin Sulfate – two naturally occurring elements that have been shown to help maintain healthy joint function and mobility – and married them with our stabilized aloe vera gel. To this, we’ve added vitamin C and MSM, a primary source of bio-available sulfur the body needs to maintain healthy connective tissues and joint function. Forever Freedom provides the usually recommended amounts of Glucosamine Sulfate (1500mg), Chondroitin Sulfate (1200mg), plus 750mg of MSM and 250mg of vitamin C per 4 oz serving. When combined, G.S., C.S.,Vitamin C and MSM provide the first line of defense against deterioration. As with other FLP products, these nutrients are sourced naturally and are considered to be exceptionally safe. Make Forever Freedom a practical and nutritious way to start your day!